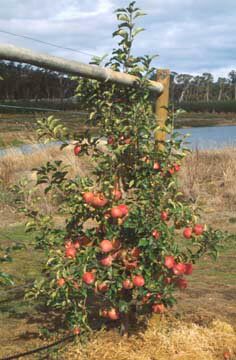 Golden Delicious × Lady Williams, John Cripps, 1973, at Stoneville Research Station, Western Australia. Very vigorous and upright, wider branch angles than in Lady Williams, large wavy-edged leaves close together; may need shoot thinning. Susceptible to scab and fireblight, fairly susceptible to powdery mildew. Lady Williams, Fuji, Granny Smith, Gala and Delicious. Large uniform, conical, long oblate; calyx in deep basin may be open in large fruit. Pink-red with yellow base colour, no russet, tender and thin. Not prone to sunburn, russet, surface cracking, bitter pit or internal disorders; immature fruit may tend to partial scald. Firm, dense, fine flesh, crisp and juicy, excellent flavour, high sugar with acid balance. Late, 1–2 weeks after Granny Smith, early to mid May; pick when base colour starts to change from green to yellow. Moderately long, up to 4 months; doesn’t scald. Note: Cripps Pink apples of an appropriate quality may be sold using the trademarked brand name Pink LadyTM. This information forms part of Agfact H4.1.12 Apple varieties.